Camarillo Car Care is a State of California Licensed Inspection and Repair Station for Camarillo, Somis and Ventura County. When your DMV Registration Renewal comes in with a notice of “SMOG CERTIFICATION REQUIRED” you can bring it to our shop for your smog check. PLEASE NOTE: The DMV has established a special type of smog check inspection station called “TEST ONLY.” When your DMV Registration Renewal notice states this, you must use a Licensed Test Only company. These companies are not permitted to provide any smog services beyond the test. The State of California will send you to one of these companies periodically. 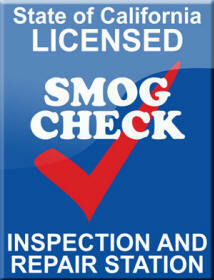 WE ARE NOT A TEST ONLY Smog Check station. Why Choose us for your Smog Check? Highly Qualified Technicians. Our techs are ASE Certified and ASE Master Technicians. This means you have great experience and training to inspect and service your vehicles. While You Wait Service: In most cases, we can accommodate an appointment that allows you to wait in our comfortable waiting room while we perform the State of California Smog Check on your vehicle. Work Done Correctly. Our technicians do the smog checks correctly so the results are accurate to the State of California standards. Call today or use our Online form to request your appointment. We can usually accommodate a “While You Wait” smog check service for you.